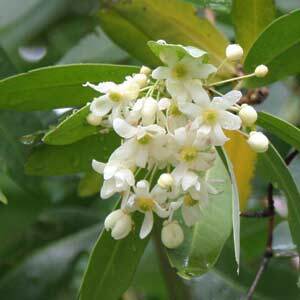 A small to medium sized evergreen tree Drimys winteri (Winter’s Bark) can grow to 10m however in cultivation it is usually much smaller. Long flowering and fragrant, attractive foliage and excellent in those difficult shady spots in the garden, it also makes a great background tree. Prefers a well drained humus rich soil, full sun to part shade. Mulch well around the plants to maintain moisture and a cool root run. Water well through the first summers, however once established, if it is grown in shade this is a remarkably hardy tree. some extra water during long dry summers may be needed. All are evergreen trees with fragrant foliage, Drimys species prefer a humus rich moist but well drained soil.